QUEENSLAND HAVE TAKEN GAME ONE 28-24 AT ANZ STADIUM TO LEAD THE 2010 SERIES 1-0. The NRL Tweet: #Origin QLD 28 def. NSW 24. Don't let 24 points deceive you - NSW had nothing in attack. QLD deserved the win - Lockyer/Thurston brilliant. Scroll down for 36 Scouting Reports + Game 1 Match Report + Player Ratings. TRIES: Darius BOYD (15th), Billy SLATER (34th), Darren LOCKYER (48th), Greg INGLIS (62nd) & Sam THAIDAY (67th). GOALS: Johnathan THURSTON 4/5 Attempts. TRIES: Jarryd HAYNE (7th), Anthony WATMOUGH (56th), Jamal IDRIS (73rd) & Ben CREAGH (80th). GOALS: Jamie LYON 4/5 Attempts. Official Man of the Match: Johnathan THURSTON, QLD. THE NRL TWEET's 4-2-1s for Game One. For QLD to win: The Maroons can't gift NSW field position with errors & careless penalties - the Blues attack won't be overly dangerous anywhere but inside the 20m zone so if QLD can limit their opposition's forays into their half - they'll win. Why will they win? Because with the attacking weapons QLD possess - they can score from anywhere on the field. Even without Cameron Smith - Queensland have the two best playmakers on the field and the four of the best five players overall in Greg Inglis, Johnathan Thurston, Billy Slater & Darren Lockyer - that bodes well for victory. Bottom Line For Victory: It all comes down to discipline for the Maroons - limit NSW's field position and QLD take a 1-0 Series lead... and get Cameron Smith back for Game 2. #Origin Just winding down after the disappointment of tonight. QLD looked dangerous every time they had the ball. NSW did not. QLD 28-24 NSW. #Origin Statistically you look at Kurt Gidley's game & go - gee he must've played well. But the issue is Jarryd Hayne offers so much more. #Origin RT @wdnicolson Hey NSW - pick some class and you might win a game. Because having class is exactly the reason Queensland are 1-0 up in the series. #Origin Is that kid in the Sydney FC jersey kidding? Did he think some soccer was on tonight? Hilarious choice Channel 9! 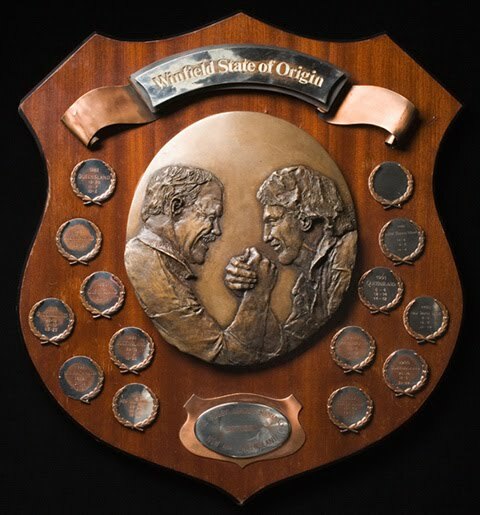 #Origin Full Game 1 recap on http://wdnicolson.blogspot.com/ tomorrow. Nic & I will break down crying as we record NOT The Footy Show Ep22. #Origin Game One of the 2010 State of Origin Series is in the books. Queensland's class told in the end & Surprise! NSW had no playmakers. #Origin Queensland halfback Johnathan Thurston gets the Official Man of the Match Award - could have easily gone to Darren Lockyer as well. #Origin FT: QLD 28 def NSW 24. Don't let 24 points deceive you - NSW had nothing in attack. QLD deserved the win - Lockyer/Thurston brilliant. #Origin HT: QLD 12 NSW 8. If Tonga or Inglis score NSW are dead & buried. NSW have nothing in attack unless in 20, QLD dangerous everywhere. For NSW to win: The Blues have picked a backrow with one purpose - to run at QLD playmakers Johnathan Thurston & Darren Lockyer all night long. NSW's side is one that will try and outmuscle their opposition and rely on field position to post points without a noted playmaker in the lineup (their best options are Jarryd Hayne who is stuck on the wing and Luke Lewis who is wasting away on the bench). The Blues best chance at victory will come from protecting a lead rather than chasing the game - so it is vital they start well. Bottom Line For Victory: Making the most of field position and tiring the QLD playmakers - if NSW do this they will go to Suncorp Stadium up 1-0 in the Series. NOT THE FOOTY SHOW Episode 22 has a full recap of Game 1 with Nic & Waz breaking down in despair... check out the Podcast uploaded Thursday May 27. GAME ONE - WHO WINS & WHY? NSW 22: J Hayne 2, T Tahu, J Idris Tries; J Lyon 3/4 Goals. QLD 18: S Thaiday, B Slater, G Inglis Tries; J Thurston 3/3 Goals. If you're watching State of Origin Game 1 with a bunch of friends - get some paper out and jot down everyone's predictions for the following categories. Scoring: Each category has its own value but basically - 1 point for 100% right (i.e. Greg Inglis scores the 1st try or picking the Game Winner - NSW or QLD), 1/2 points for 50% right (Pick the score is NSW 20-12 and you had either NSW 20 or QLD 12 - you get half a point.) Pick the Score Exactly is worth 3 points. Most points at the end of the nights gets the glory or if you decide - a prize of your own choosing before kick-off. Only one player/score is allowed for each category - first in best dressed but only open up one category at a time to avoid one person stealing all the good options! The NRL Tweet scored 2.5 points out of a possible 10 points. How did you go? Too many sleeps til Origin 2! <> OFFICIAL NSW & QLD Sides are NAMED. May 17 Update: Well we didn't see eye to eye with the NSW Selectors at all. Nic picked 7 from 17, Waz picked 8 from 17 - but remember they were the teams we'd pick not the team we thought NSW Selectors would. Translation = NSW are in a whole lot of trouble. Please Note: We filmed it on April 22, 2010 so any injuries sustained in Round 7 & beyond of the NRL obviously have an impact on some of the players we selected and if any more players get hurt before the team is picked - once again realise we filmed it on April 22 so there's not much we can do about predicting injuries.